But I have three little kids, a career, friends, the vibrant treasures of Los Angeles to explore, and yet another space opera novel to indulge in. So I take what I can get. 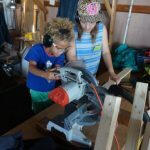 When I make music, or make dinner, or make something out of Legos with my kids, or make something in reDiscover’s woodshop, it is a good day. I like to use my hands, to transform some material into something useful, whether loose parts into a toy or raw vegetables into a soup. There’s an immediacy to making that is hard to reproduce. When I get a chance, the repetitiveness of much making, sanding down each edge of a block or cutting carrots into rounds, allows me to study and tinker with my technique, to have a Platonic ideal of an apple slice in mind and constantly adjust my perception and my actions to get closer and closer to that ideal. That instant feedback, and when its humming along, that sense of accomplishment, is only otherwise found in my social interactions. A conversation that’s really working, with an old friend reminiscing or my spouse analyzing the news of the day, gives that satisfaction of making. Here we are making connections between minds and between ideas, making order out of the loose parts of today’s thoughts and memories. These kinds of conversation often feels like play, tinkering with an idea as we work through its meaning and humor and metaphors, sometimes staying with it, sometimes letting it float up and out and moving on. Writing feels like a version of this with just myself, plus the bonus to go back and tinker with ideas recently written, editing and improving to make it better. Orthogonal to all of this is meditation. I’ve practiced a number of different types of meditation and find it does not work in the same methodical or playful ways of making or talking or the kind of linear organized thinking I have been trained in. It still feels like a kind of making, though, something under the surface, or a chance to integrate ideas and ways of being that I can’t address head on. And then there’s music. I love to sing, in choirs, in the shower, making up little songs with the kids. I whistle, hum, and once in a while get out my flute or recorders. Making music with others, is an act of creation as substantial as making a piece of furniture, but ephemeral. Recordings don’t capture the connection that making music with others provides. I sing in my church choir and practicing a piece is this amazing process of tinkering as we try out how to move our voices together to match the music and one another, guided by our conductor who is listening and correcting the gestalt such that in the space of 20 minutes we can go from a mess of sounds to a beautiful unified harmony.